Ships from and sold by Wordery AU. "Brilliant! Well written and easy to read with excellent story lines!" Good clean fun! No swearing and no adult concepts. The Missing Case is book TWO in a thrilling series by award-winning author, Simon Haynes. Hal Junior's spent his entire life aboard a space station, and he'd do anything to go camping. Well, almost anything. No homework, no chores ... and absolutely no babysitting! Now Space Station Oberon is expecting a Very Important Person, and Hal's been given a choice: he must look after the VIP's snotty little kid, or miss out on a camping trip to planet Gyris. It turns out the kid is the least of Hal's problems, because together they uncover a terrible secret which could mean the end of the space station! 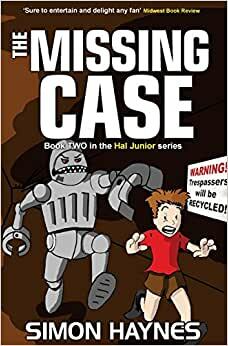 The Missing Case will appeal to kids with a sense of humour and a taste for adventure. This is the second book in the Hal Junior series. Book one, The Secret Signal, and book three, The Gyris Mission, are also available. * Simon Haynes is the winner of the Aurealis Award, Australia's premier award for science fiction. Start reading Hal Junior 2 on your Kindle in under a minute. Simon Haynes was born in England and grew up in Spain, where he enjoyed an amazing childhood of camping, motorbikes, air rifles and paper planes. His family moved to Australia when he was 16. Simon divides his time between writing fiction and computer software, with frequent bike rides to blow away the cobwebs. His goal is to write fifteen Hal books (Spacejock OR Junior!) before someone takes his keyboard away. All of the Hal Spacejock books are brilliant. Well written and easy to read with excellent story lines. Would recommend the entire series to anyone. Space Station Oberon is hosting an important visitor, and everyone is on their best behaviour. Even Hal Junior is doing his best to stay out of trouble. No chance! From multi-coloured smoke bombs to exploding space rations, Hal Junior proves trouble is what he's best at!